For me, it started with Shirley Temple movies. In childhood, my local library was tucked away in a school district building, limited to a long stretch of a hallway and two cramped children’s rooms. The library has since become a sprawling, gorgeous building a block away from this old location, but my formative memories as a reader rest within visions of that confined space, its dirt-brown carpet, the holiday season’s glass case display of a wintry village, and the chapter book alcove’s solar system mural. At the end of the long hallway were the shelves of VHS tapes, when DVDs were still a novelty, when your main hope for a movie selection was that the person who checked it out before you had rewound the tape. In a time when our movies now start within a short series of clicks, I marvel over how foreign rewinding seems to me now. God forbid you check out a dramatic epic that was split between two VHS tapes. 1) Lady and the Tramp being serenaded over a spaghetti dinner, but especially when accompanying the 102 Dalmatians twist of two human actors, an eventual real-life couple that’s still together today, connecting over that sweetly shared meatball. 2) A couple’s everyday jaunt through a London tube station in About Time, capturing the stresses and the wonders of the mundane yet magical. 3) Jimmy Stewart and Donna Reed huddled around a telephone together, just barely balancing between being calm childhood contemporaries and passionate, loving partners. 4) Jimmy Stewart’s slow, twinkling grin in any movie. 5) Captain von Trapp straightening his gloves before stepping in to teach Maria how a man dances. My “If These Books Were Movies” posts are some of my favorite to write. Books have always played like movies in my head, and I love when a certain actor immediately comes to mind upon the introduction of a book’s main character. The books I’ve gravitated toward lately have led to particularly vivid characters, which made the following “dream cast” selections some of the most “right” picks in awhile. The downside of these kind of blogs is that I’m often so set on these actor portrayals that any chance of me enjoying an actual future adaptation is slim. But then again, some books are best lived in your head, right? Blame it on the #RenewTimeless mission dominating my mind for two weeks now, but I immediately pictured Timeless’s Matt Lanter as Holland golden boy Jack. 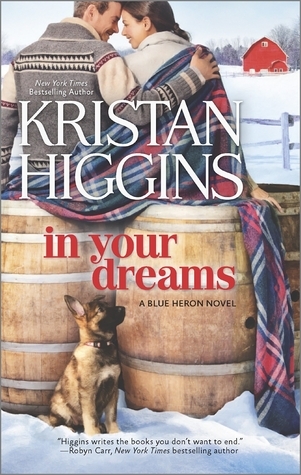 In Your Dreams is the Blue Heron story centering on him and stoic local cop Emmaline (who I may have pictured as Timeless leading lady Abigail Spencer, but let’s not get too cutesy). I like that on the surface, Jack is seen as a protector, but he has some intense personal demons that In Your Dreams explores. I’ve only seen Lanter in Timeless, but Jack definitely has overlapping personality traits with his soldier character Wyatt, which made this casting choice obvious.